Soft Boundaries describes the current state in which we live - a state where experiences, effects and understanding gained from the digital realm move freely into our tangible reality. Boundaries that may once have been neatly defined, are now soft and pliable - they are superficial membranes that positively support the act of osmosis between digital and material. The body is at the centre of Harris’ investigation into this area. Through considering the concept of ‘corporeal schema’ (or body image), which can be understood as the body’s capacity to be open to, and intertwined with the world, and where body image is not fixed or rigid but adaptable to the myriad of tools and technologies that may be embodied (1), she considers the contemporary body as one not limited by the boundary of our skin - our bodies have become media and media are reconfiguring our matter (2). Can our everyday technologies alter our perception of touch? - our perception of materiality? - our perception of where the limits of our own bodies lie? 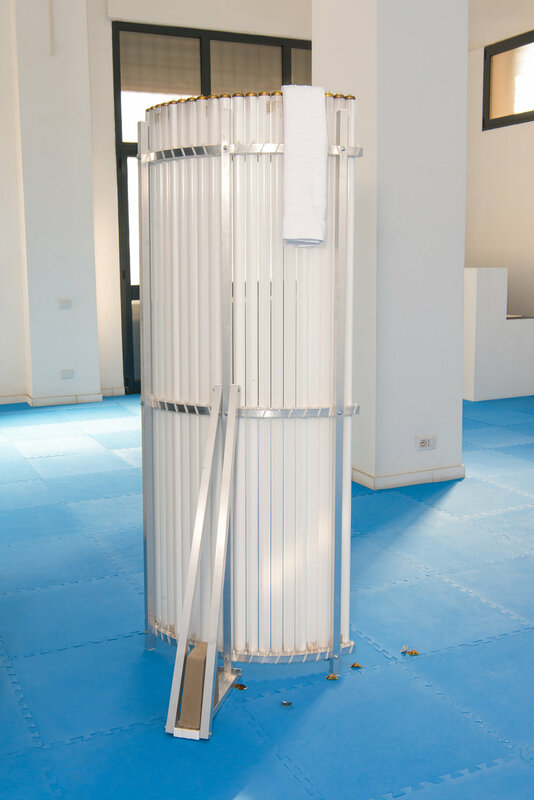 *The sun tanning bulbs are sourced from recycling repositories, that receive bulbs from tanning salons nationwide, after 500-1000 hours of commercial use. Full film length 10' 21"
Harris’ practice is informed by the murky area between materiality and digitality, considered from the site of the human body, and her work spans both sculpture and digital forms. 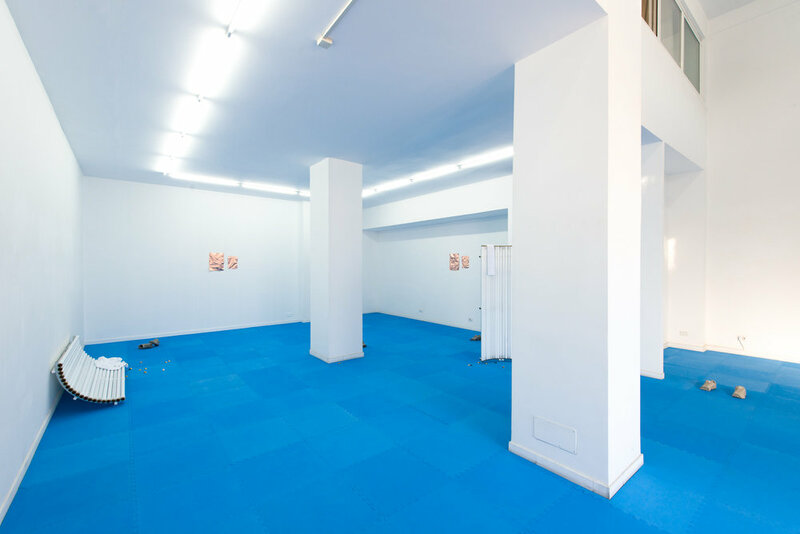 In the exhibition, she calls the viewers own body into the question through an experiential element - a soft foam flooring that gives beneath one’s feet. 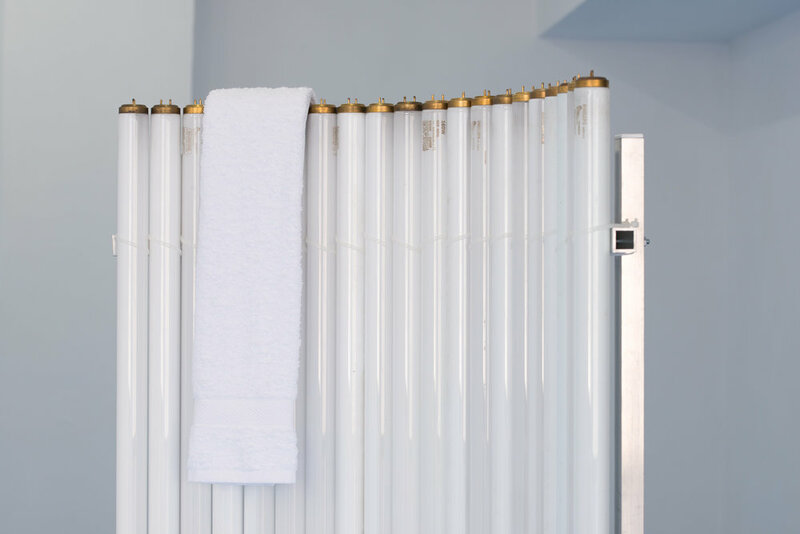 She also introduces the idea of skin as a phantom presence, through sculptures ‘Golden Brown Texture Like Sun’ that are comprised of used and expired sun tanning bulbs - bulbs which have acted upon countless human bodies - transferring UV rays into their skin. 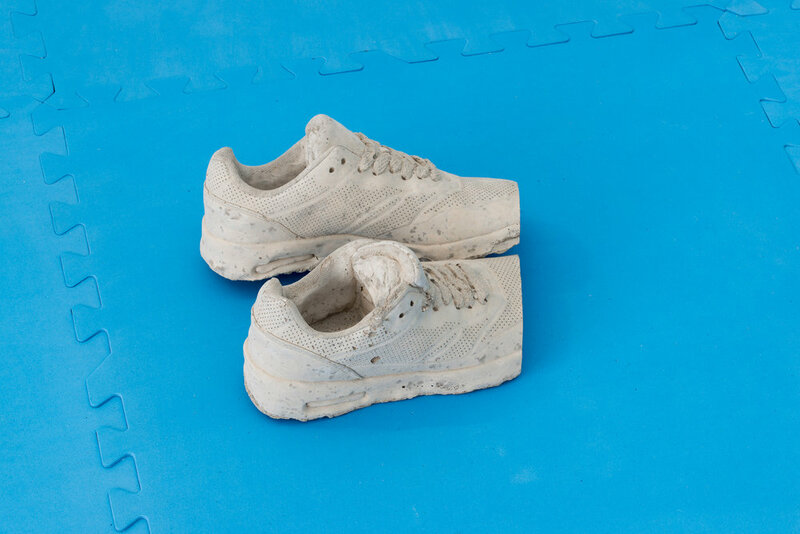 These ‘countless skins’ become veritable ghosts in the exhibition, and golden, cone shaped eye protectors that are a noticeable feature of tanning salons, litter the gallery floor. The series ‘Pelts’ comprised of thin copper surfaces, alongside a film in the basement also titled ‘Pelt’, focuses on digital rendering of skin, where skin, in 3D modelling as well as 3D printing (colloquially called ‘pelts’ or (animal) hides, by programers), is nothing other than pure surface - depth is rendered as an illusion as pixels in a jpeg, and wrapped like a blanket on a digital 3D form. In the sculptural works, Harris imagines a conversion through embossing the jpeg into a surface, creating works that slip between surface and three-dimensional form. 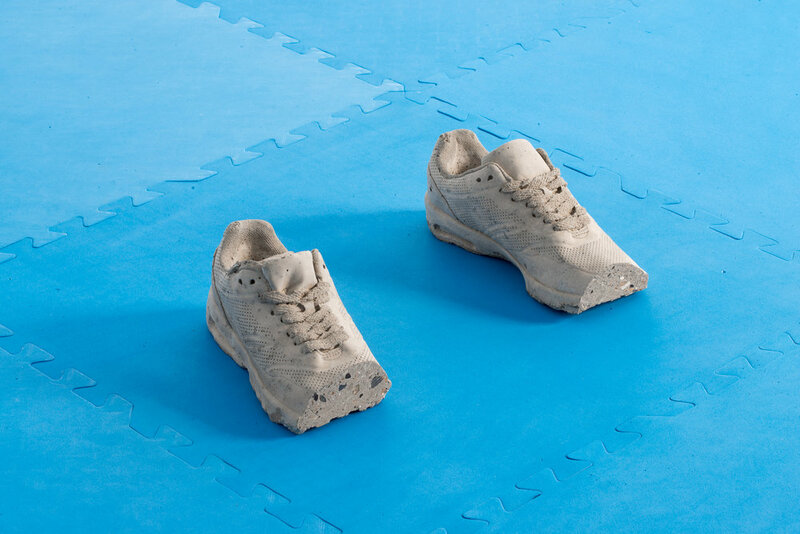 The sculptural series ‘At the Edge of the Frame’, which are cast concrete shoes, Harris has applied a digital gesture of ‘cropping’, familiar from Photoshop, Instagram and similar, to material form. 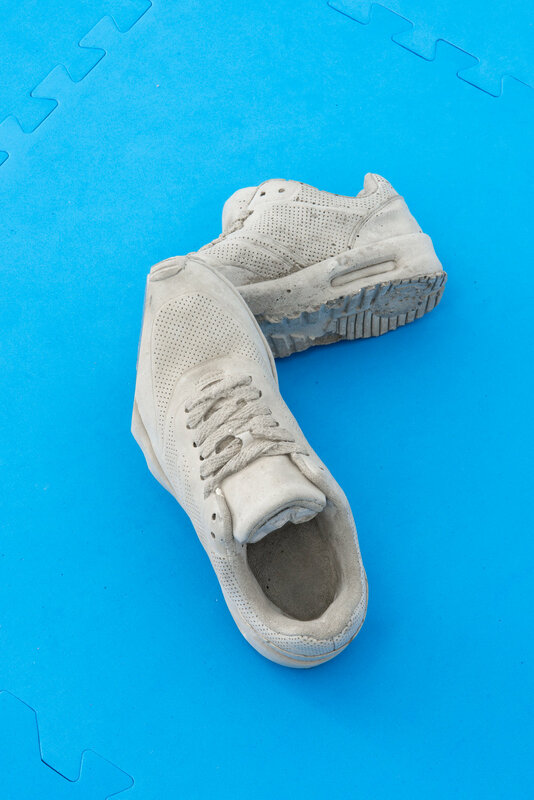 One clean line dissects each pair of shoes, and through this she creates a form that plays with our familiar understanding of digital imagery, whilst with the same gesture, reveals the sculptures solid concrete interior and their brutal ‘there-ness’ of matter. In the basement of the gallery the film ‘A room within which the computer can control the existence of matter’ takes it’s title from a quote by Ivan Sutherland, creator of the first virtual reality (VR) machine. 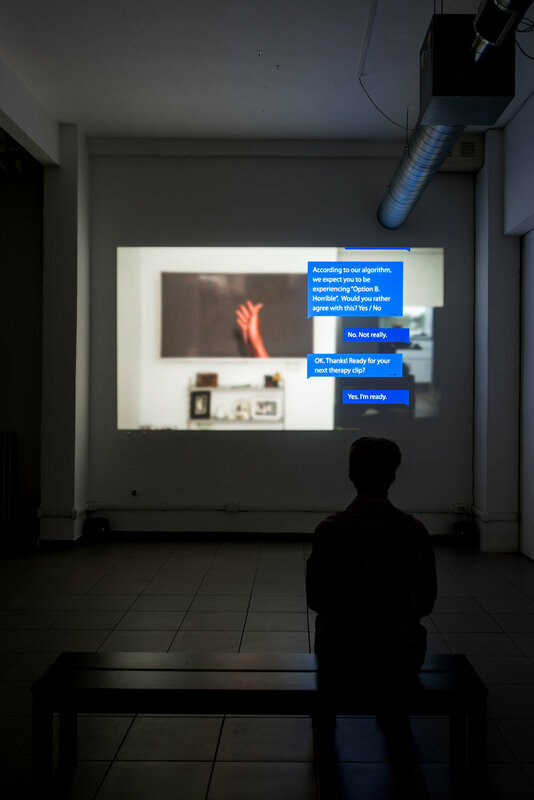 The film considers the potentiality of digital experience to reform how we understand our own human body. It combines research on ‘corporeal schema’ - embodiment within virtual reality - and Harris’ long-standing interest in virtual phantom limb therapy (VPLT) (3), and probes whether our digital experiences could be considered in the same vein as that of VPLT and VR embodiment experiments in altering our perception of our bodily state, but rather subsumed and unnoticed as part of our everyday reality. 3. VLPT or Virtual Phantom Limb Therapy, is given to amputees to relieve pain in a phantom limb. The therapy is essentially an augmented reality, where the amputee, with the aid of applied sensors on the stump, a camera and image on a monitor, re-experience a virtual version of their missing limb, and train their brain to accept the virtual limb as part of their physical body.